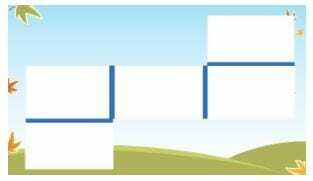 Guest Post: The Writing Recipe – How “Essay Framing for ELL” Creates Confidence Writers in ALL of Us! Over the past few months, I’ve published several series of guest posts from teachers of English Language Learners: one on teaching math, another on ELLs and Special Needs, yet another on teaching Science to ELLs, and one on teaching Social Studies to ELLs. I also published a mini-series on evaluating foreign transcripts. This latest series is on teaching writing to ELLs. Dorina Sackman-Ebuwa is a 20 year ELL teacher. Also known as Miss Dorito to her students, she is the 2014 Florida Teacher of the Year and National Teacher of the Year Finalist. Dorina currently travels the country with her company B.E.L.I.E.V.E.! as an educational speaker, presenter and “teacher on loan” where she studies ALL students’ perceptions of the teachers’ teaching to drive individualized professional learning, increase reflective practice and reignite passion in teachers. She is currently a doctoral student studying emotional intelligence in teachers and when not wearing her teacher hat, she dons a Stetson, tending to her beloved ranch filled with rescue cows, goats, chickens, miniature ponies and two floppy eared bunnies, Paula and Coelho. Dorina can be reached @2014FloridaTOY and believeconsultingllc@gmail.com and dorinasackman.com. Her new book “The Writing Recipe: Ingredients for Empowerment on Paper” is set to release in June 2019. Oh December! ‘Tis the season for taking out all those delicious recipes written on index cards and creating wonderful goodies to share! What could be better than following a time-honored recipe, following it to a tee then adding a few new twists to make it your own? Perhaps relishing at the finished product and being able to share it with family and friends makes these moments an even sweeter accomplishment. I bet most of you thought I was talking about baked goods. Well, take off your aprons, grab some NEW 5×7 index cards and be amazed at the Oh no! I was talking about The Writing Recipe: Ingredients for Empowerment on Paper. Our classrooms are the families and the recipes are Essay FRAMES that students learn together then, when ready, choose to add other “ingredients” to make it their “own”. This is a fool proof way to bring about the love of writing, see the natural writing process and progression of little writers whilst beautifully aligning state writing standards. Alas, with every family recipe, comes a story of how it came about. The Writing Recipe was one of strategy and survival! As an ESOL and Bilingual Educator for 20 years, I have watched many ELL students, K-16 struggle with putting their thoughts on paper. And that’s where I saw it; it was the paper. I watched loose leaf after loose leaf neatly taken from a three-ring binder or haphazardly ripped from a spiral (ignoring the perforations; doesn’t that drive you crazy! ), become wrinkled and wasted, filled with words that were there to simply fulfill and assignment or fill the page. I tried technology and Word was worse, a blank page that became filled up in time and space with more purple Lucida Handwriting in 16-font and then copied text or literal translation from Google. Any which way you looked at it, students were not “feeling” what they were putting down on paper, losing assignments on that thing sheet or “accidentally unsaved” Word Doc. I loved my kids too much to see them struggle. I knew it was my approach that needed to change, and that change was about to come. I was asked by my friend and mentor James Dean to attend a Thinking Maps training with an amazing woman named Melba Johnson. Melba introduced me to a brilliant form of structured essay writing that has since been the inspiration to the creation of The Writing Recipe. From this experience, I slowly began creating lessons for The Writing Recipe in my middle school classes. Content area teachers came to my classes to ask me what I was doing with our ELL kids because their writing was greatly improving in class. Our ELL babies had more confidence in speaking, their writing scores went up, even surpassing heritage English speaking students! Soon, Journals and Writing Portfolios became the norm and now after ten years, The Writing Recipe has truly inspired students at the elementary, middle, high, and community college level to fall in love with writing. That’s when I knew I had to share it with other ELL educators and did so here. Now, an ELL teacher leader turned ELL teaching consultant, who loves to empower teachers with enhancing their practice with the most effective strategies to reach and teach ALL students, I have listened to great educators admit they are reluctant to teach writing because of two honest and vulnerable answers: a) they don’t feel secure in teaching writing and b) it’s not tested in their grade level. Both content area and ELL teachers were very open in expressing their concerns about being inadequate in writing, “I’m not very good at writing so I’m intimidated to teach it.” Others said, “It is like pulling teeth to gets kids to write, there isn’t any writing program so I’m on my own to plan something and I haven’t a clue, nor the time to put it into our day.” “Kids and they are so disinterested. To be honest, I struggle with it myself, so I may be using that as an excuse!”. These incredible educators needed something to boost their confidence and spark a love of teaching writing to ALL our students. Moreover, in recent months and traveling to many states, it seemed writing often falls at the wayside because of testing. Many teachers are honest in saying “if the kids aren’t tested in writing in the grade I teach, it gets pushed aside for reading. For example, a third-grade teacher is not testing in writing, but the fourth-grade teacher is. Because there is such a focus on testing, writing gets ignored. When it comes time for our ELL babies to go to the fourth grade, they are at an even greater deficit. This important but often overlooked aspect of language acquisition ultimately adds to the creation of a growing population of students in our public schools, LTELLs (long term English language learners). Therefore, writing is now an issue of equity and empowerment for ALL students (I use the term ALL as an acronym for all students who are learning academic literacy: Academic Language Learners!). The Writing Recipe does that. Each student receives five 4X6, or 5×7 index cards and a strip of painter’s tape. The students create a “tetronimo” (for all you Tetris fans!). I also love to use envelopes for the younger grades to learn key words as well as students who may have challenges with writing. You can put the words inside the envelopes and have the students glue stick the words that coincide with each colored index card or make it like sentence strips and create the essay that way! The reason for the painter’s tape is because the tetronimo is flexible and can be manipulated and folded to look like a one, two and three paragraph essays. This is wonderful and easy way to differentiate instruction, you are using the same tetronimo, just asking the students to adjust it to fit their linguistic and academic levels. Denison Schools in Iowa are using The Writing Recipe, you can see what they are doing here. I must mention another reason I did the stoplight outline of colors. It was much cheaper to get white index cards than colored index cards and teacher found more consistency across the content areas! The students learn each of these key transition words and phrases as it pertains to the Writing Standards. From sequencing to opinion to informational, we need to create a print rich environment where the students are exposed to the academic language that comes with each style of writing. From word walls to word journals and tetronimo posters in each room, our ELL babies will thrive! 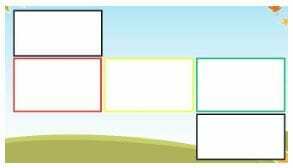 Once the students understand how the tetronimo works and the use of academic language for each index card, it is time to show them an Essay Frame. 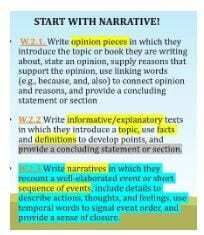 Using your state Writing Standards, I recommend starting with narrative, then opinion then informational. This is the truest progression for an ELL for comprehension of a piece of literature: understand the story, write an opinion about the story then find a topic of interest within the story to gather information. 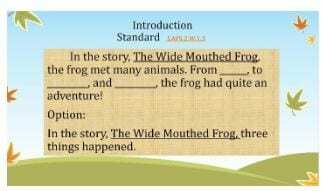 For this example, I used The Wide Mouthed Frog by Ana Martin Larranaga. I use the K.I.S.S. method (keep it simple students!) to introduce the concept then, a gradual release into more challenging text. The retention of knowledge and “how to” is far greater with an “easier” story! 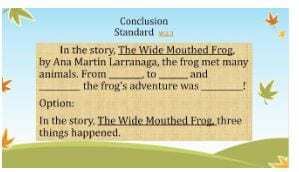 I begin with “Intro” and “Conclusion” to show the students the similarity. There are two option to meet the needs of ALL students. The students simply fill in the blanks. I have them work in groups first to get acclimated to the process but gradually have them work in pairs and them independently. 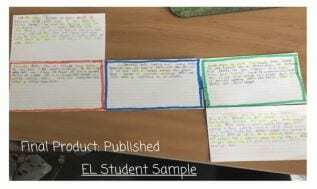 The Writing Recipe creates intrinsic motivation because after they feel comfortable with the Essay Frame use, students want to have different answers than their peers. Naturally, like a recipe you have been doing for years that becomes second nature, you enhance it with your own special touches. The same goes for The Writing Recipe. At first, the “recipe” is the same! However, over time, each student becomes more confident thus ready to put their spin on the Essay Frame. It is magical to see this progression of understanding and watch them thrive! The stoplight section of the tetronimo and other parts of The Writing Recipe can be seen here. Once students complete their tetrominos, they learn to transform their work into a full essay on paper. This become much easier since the structure and layout is already there for them to see. I also recommend using Google Docs to make a third and final piece that is best for editing and revising. So, our ELL babies are writing one essay three times in three different formats that not only coincide with standards but gives them that reassurance each time they write. Watch the magic happen! Our ELL students will get accustomed to the process of Essay Framing in The Writing Recipe, writing a paragraph, five paragraph essay, or short answer will become an empowering experience! You will notice students wanting to break away from The Writing Recipe and go beyond the Essay Frame and into their own writing style. Encourage this, as The Writing Recipe is like any scaffold, it needs to come down when it is time! Consistency and cross-curriculum use is the key here. Keeping up with it means at least 30-45 minutes a day dedicated to Writing. 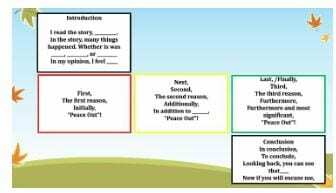 Essay Framing using The Writing Recipe is a powerful and empowering way to teach writing to our ELLs. Like a treasured recipe, once comfortable with the ingredients, one can branch out and make it one’s own. 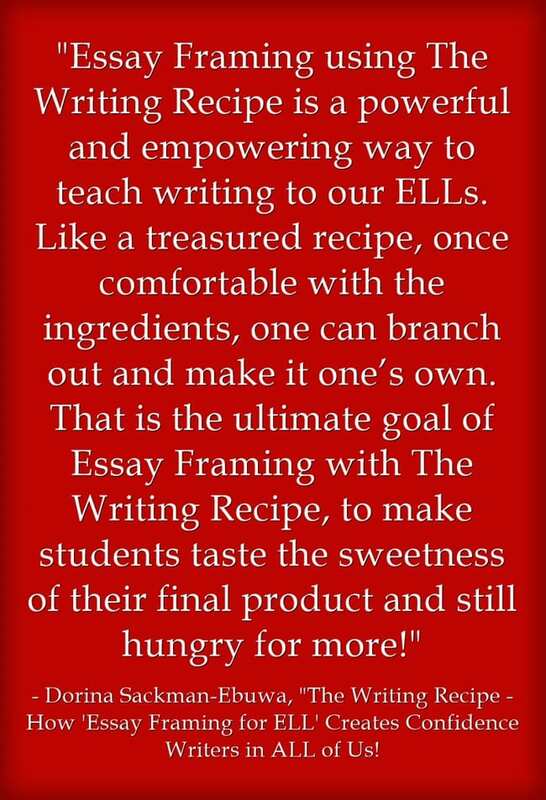 That is the ultimate goal of Essay Framing with The Writing Recipe, to make students taste the sweetness of their final product and still hungry for more! So get those ingredients of your recipes ready for you and your students. May your fall in love with teaching writing and create empowered writers in your classrooms! Happy writing!